In their fine book, Art & Fear: Observations on the Perils (and Rewards) of Artmaking, David Bayles and Ted Orland make a distinction between art problems – which are unique – and ordinary problems – which are, well, ordinary. Their point here is that ordinary problems may be ordinary but they are in no way trivial. Ordinary problems are the ones that consume too much of an artist’s time and keep the artist out of the studio. Things like bookkeeping, cleaning the studio, sending messages, sending work, running errands, buying supplies and, yes, writing about it all. My ordinary problems multiplied these past few weeks with a major relocation. Until this past weekend, I had not painted anything for a couple of months what with planning the move and then making the move and unpacking from the move. Finally, in a more or less desperate, life-saving effort, I cleared a space on the dining room table and got out my paints. The new work table is in progress, but I couldn’t wait. I generally work now on larger canvases upwards of 20 x 24, but the dining table won’t accommodate a work that size, so I scaled back to 11 x 14 and just started playing. The piece is definitely not my best work, but it moved me from the ordinary problems to an art problem and that made it all worthwhile. 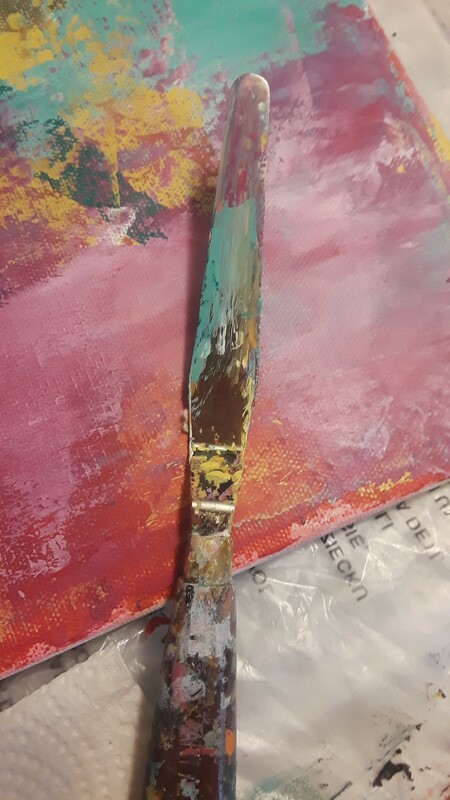 I cherished the feel of the palette knife in my hand again. Loved watching the paint ooze out of the tube. Had fun with a different medium. Just played. Reminded myself of who I am and what I do, and reminded myself that I know how to do it. The new work table will be finished in a week or so. The art supplies will be organized again. I’ll get back to larger canvases. I’ll do something with the rough start I made this week. I sense that something will happen to the work in this new place with a new view and different light. I have no answers yet, but I’m ready for whatever it is. It will be a great way to begin the new year.